A simple upgrade that Android smartphone users have enjoyed for years may finally be coming to the iPhone: wireless charging. The technology would allow iPhone owners to simply lay their devices on a charging pad – something that's also been embedded in furniture and vehicles – to recharge. Wireless charging hardware possibly related to the next iPhone has been shown in a series of photographs published by Chinese blog site Weibo. While add-on, external iPhone covers have allowed wireless charging for some time , if the photos and a leaked document are genuine, the "iPhone 8" could contain the technology natively. Apple is planning to hold a product launch event Sept. 12 at which it's expected to unveil its next iPhone and an updated Apple Watch. The iPhone has not yet been given a name, though most experts expect it to be called the iPhone 8. The photographs show wireless charging receivers on an assembly line and a leaked document from Apple for its HomePod Firmware for iOS mentions inductive wireless charging and electric vehicle charging. Documents showing inductive wireless charging. HomePod was announced at this year's Worldwide Developers Conference (WWDC) and is a Siri-activated speaker system similar to Amazon Echo powered by Alexa. The bad news? Apple is not expected to "enable" the wireless charging capability on its new iPhone until sometime after it ships this fall, meaning there will have to be some type of software upgrade to activate the function, according to a BGR report. Additionally, if Apple chooses to go with a proprietary wireless charging technology, iPhone users will be pigeon-holed into buying a specific charging pad sometime after the iPhone 8's launch. 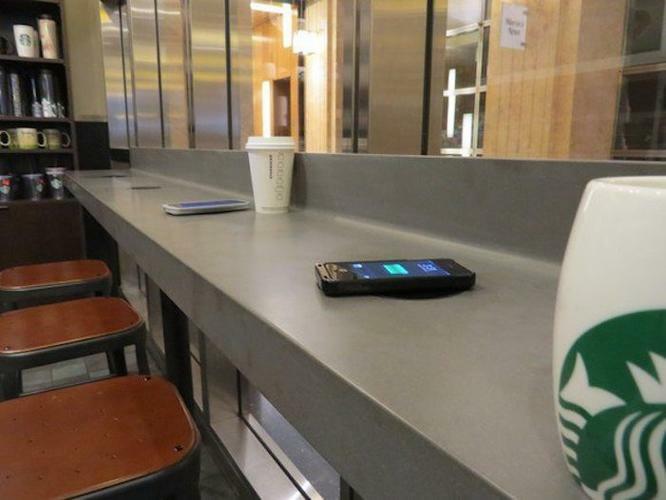 While wireless charging has yet to become a widespread technology, it has been deployed by several restaurant chains, airports and in some other public venues. What may be an issue, said Jack Gold, principal analyst at J. Gold Associates, is that an Apple embrace of proprietary technology would require iPhone users to remember to carry their wireless charging pads wherever they go – just as they do with a lightning connector today. "In the past, I just went to a local store and bought a cable -- readily available," Gold said. "Will chargers be that readily available? Probably not in the short term. And if Apple goes with a proprietary charger, as they often do go proprietary so they can sell their own peripherals, how hard will it be to get one if needed? USB and USB-C is becoming ubiquitous, but not so wireless charging, which will take a few years to become really ubiquitous." Though he has no concrete information about the wireless charging reports, Gold said he believes the iPhone 8 will offer wireless charging, as Apple has systematically been pairing down hardware on its smartphone. "This has more to do with sleekness of design than anything else in my opinion," Gold said. "But in reality, Apple has been trying to remove all vestiges of connectors from their device anyway -- no more earphone jacks -- so this is just one more way to make the device thinner, sleeker overall and have no openings around the periphery." In 2005, an Apple patent described technology for an iPod using zero-contact induction for not only charging but data transfer – most likely to manage device charging. In a 2012 Apple patent filing, the company described a near-field magnetic resonance (NFMR) power supply "arranged to wirelessly provide power to any of a number of suitably configured devices." Apple's patent description indicated a charging distance of about one meter, which could be projected out from a desktop computer such as an iMac to power peripheral devices such as a wireless mouse. According to MacRumors, Apple has also been eyeing a company called WiTricity, which licenses a magnetic resonance charging technology that can be projected over several feet away. Apple did not return a request for comment about its wireless charging plans. If the HomePod leak is any indication, however, the type of wireless charging Apple could roll out for the iPhone 8 would be more akin to the tightly-coupled technology it used on the Apple Watch versus loosely-coupled magnetic resonance charging that allows more freedom of placement on a charging surface. As Apple has been researching wireless charging, competitors have charged ahead. Samsung, Apple's chief smartphone rival, has been selling smartphones with native wireless charging for years. According to IHS, 80% of consumers want wireless charging in public places, so enabling it in mobile devices is simply good business for mobile providers. The problem is that even as the wireless charging industry has consolidated over the past several years, there are still competing standards, which means not all smartphones or tablets can use public charging stations. If Apple adds another, it will further complicate an already small market.